The most frequently measured environmental quantity is “Temperature” This might be expected since most of the systems are affected by temperature like physical, chemical, electronic, mechanical, and biological systems. Certain chemical effects, biological processes, and even electronic circuits execute best in limited temperature ranges. Temperature is one of the most frequently calculated variables and sensing can be made either through straight contact with the heating basis or remotely, without straight contact with the basis using radiated energy in its place. 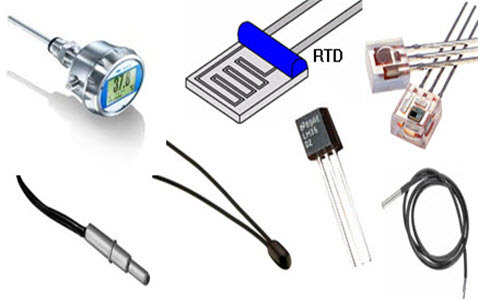 There is an ample variety of temperature sensor on the market today, including Thermocouples, Resistance Temperature Detectors (RTDs), Thermistors, Infrared, and Semiconductor Sensors. Usually, a temperature sensor is a thermocouple or a resistance temperature detector (RTD) that gathers the temperature from a specific source and alters the collected information into understandable type for an apparatus or an observer. Temperature sensors are used in several applications namely HV system and AC system environmental controls, medical devices, food processing units, chemical handling, controlling systems, automotive under the hood monitoring and etc. The most frequent type of temperature sensor is a thermometer, used to determine the temperature of solids, liquids, and gases. It is also mostly used for non-scientific purposes as it is not so accurate. The different kinds of sensors are categorized by the sensing capacity of the sensor as well as the range of applications. The different types of temperature sensors include the following. 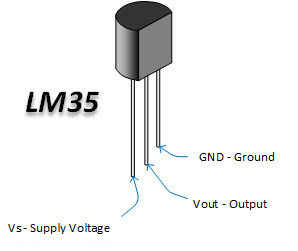 The LM35 is one kind of commonly used temperature sensor that can be used to measure temperature with an electrical o/p comparative to the temperature (in °C). It can measure temperature more correctly compare with a thermistor. This sensor generates a high output voltage than thermocouples and may not need that the output voltage is amplified. The LM35 has an output voltage that is proportional to the Celsius temperature. The scale factor is .01V/°C. The LM35 temperature sensor is used to detect precise centigrade temperature. The output of this sensor changes describes the linearity. The o/p voltage of this IC sensor is linearly comparative to the Celsius temperature. 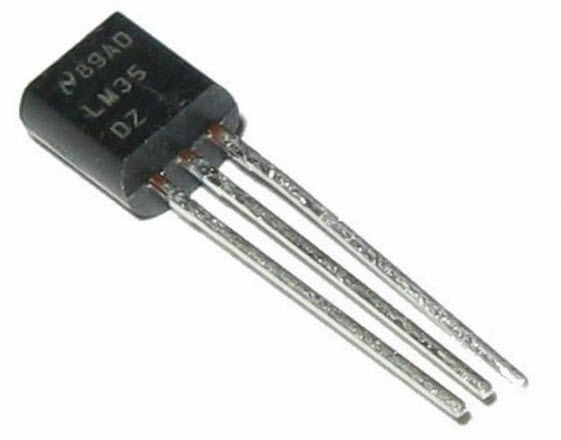 The operating voltage range of this LM35 ranges from-55˚ to +150˚C and it has low-self heating. This is operated under 4 to 30 volts. The most extensively used electronic devices are operational amplifiers, which are certain kind of differential amplifiers. Temperature sensor circuit has terminals such as two inputs like non-inverting (+) and inverting (-) and only one output pin. 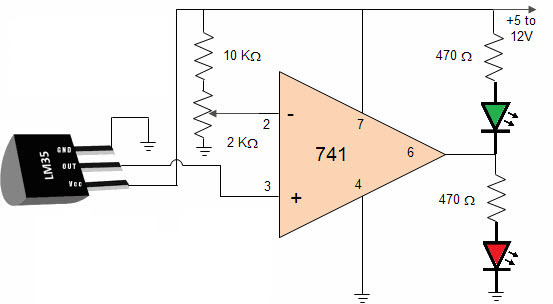 Operational amplifier IC741 is used as a non-inverting amplifier. The variation between the i/p terminals amplifies the circuit. The amount produced by IC2 amplifies in an amount to the temperature by 10 mV per degree. This unstable voltage is supply to a comparator IC 741. OP Amplifier is the most generally used electronic devices today. The IC 741 op-amp is one sort of differential amplifier. We have used IC741 as a non-inverting amplifier which means pin-3 is the input and the output is not inverted. This LM35 temperature sensor circuit amplifies the difference between its input terminals. The advantages of temperature sensor include It has no effect on the medium, more accurate, It has an easily conditioned output and It responds instantly. This is all about temperature sensor circuit and its working principle. We believe that the information given in this article is helpful for you for a better understanding of this project. Furthermore, for any queries regarding this article or any help in implementing the electronics projects, you can feel free to approach us by connecting in the comment section below. Here is a question for you: what do you mean by a heat sensor? Can i use 12 volt for this application.when i use 12 volt ic75 become too hot.what is the problem…want to add any other circuit element?